Mangalore Refinery and Petrochemicals Limited (MRPL), Is Appointing Eligible People For The Graduate & Technician Apprentice Trainees Under Apprentices Amendment Act 1973. So Interested People Can Start Filling Up The Online Application Form, From 18th Of April, 2019, Onwards. Total Number Of Vacancies →195 Vacancies, Kindly Do Check Out The Image Below For Vacancies Distribution, Educational Qualifications And Stipend. B. Eligible Criteria For Graduate & Technician Apprentice Trainees Job Vacancy In MRPL Recruitment 2019 Notification. Age Limit →Not Mentioned On The Notification. 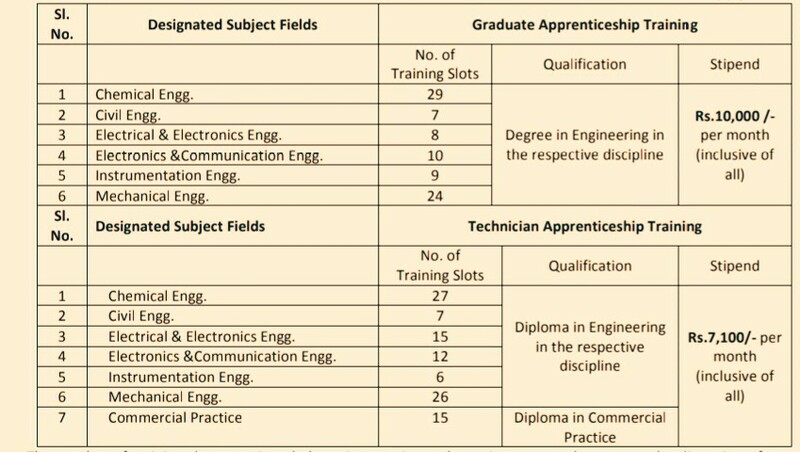 Educational Qualifications →Provided On The The Above Image. Mode Of Examination/Selection Process →The selection process shall consist of written test. The candidates shall be considered for engagement based on the marks scored in written test and subject to meeting the advertised specifications, verification of documents/any other criteria prescribed by MRPL etc. Last Date For Online Application Form Submission →17th Of May, 2019. Now Apply For Graduate & Technician Apprentice Trainees Vacancies In MRPL Recruitment 2019.